Camares, sector, quiet, for sale, house with terrace and non-adjoining land. 100 m², living room 25 m² overlooking terrace 45 m², stay 25 m², kitchen, two bedrooms and bathroom, attic 25 m² amenageables. Garage 28 m². 4.8 hectares of land. Ideal secondary residence. Saint Beaulize, for sale, house with garage and shed. 75 m², living room with kitchenette 38 m², two large bedrooms and bathroom. Garage 65 m² and 75 m² shed. To visit without waiting. In the southwest, in the wilderness far from any noise, 42acres property with stone house of 100m2 of habitable surface and outbuildings. 30M2 living kitchen, 14m2 living room, dining room of 21m2, 2 bedrooms. Cellar under the house. Large barn of 120m2, 35m2 stable, 35m2 garage, well and cistern. In the south west of France, in the Najac village, close to the 13th century church, a 18th century stone house of 134m2. A large living room with kitchen of 62m2. 2 bedrooms, an attic of 40m2 to convert. Wine cellar with inside well of 67m2. Garden of 35m2 with nice view threw the Aveyron valley. Camarès area, on the edge of hamlet, for sale, house in the countryside. 75 m², living room 45 m² with kitchen area and fireplace, mezzanine, bedroom and bathroom. Holiday house with open views on Rance' Valley, South exposure. 3.3 hecatares woodland not attached. Saint Victor, in the countryside, house with 3.6 hectares of land. 80 m ², living room sejour 21 m ², kitchen, two bedrooms, two bathroom... Outbuilding in ruins amenageables, southern exposure, clear view. Coupiac, quiet, character hamlet, house with courtyard and barn. 120 m² livable, living room 50 m², fireplace, pellet stove, two large bedrooms, two bathrooms. Renovated with taste, 2 courtyards 80 and 30 m², barn 40 m², septic tank to norms. Made up of 3 big plateaux, including the famous Larzac, Aveyron is a succession of mountains, hills, deep gorges, dolmens and medieval villages. The department is well known for its Laguiole folding knives or its famous Roquefort cheese. The property market in Averyron remains affordable and one can find an apartment or a house there to match one's budget. Why not in Villefranche-de-Rouergue, charming medieval country town on the banks of the Aveyron, or in Conques, major stopping point on the Saint Jacques de Compostelle pilgrims' path? 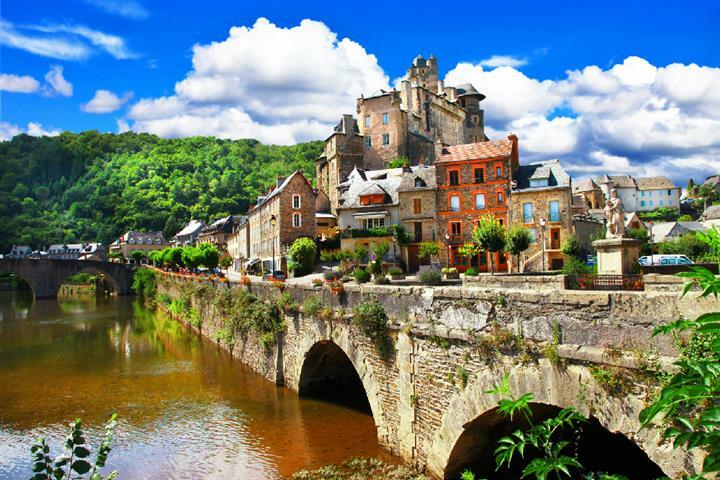 But maybe you would prefer to buy property in one of the 10 villages listed as the Most Beautiful Villages in France. The real bonus: lively markets everywhere, just great visually, and those smells!